The first crop ready for harvest is always Radishes. 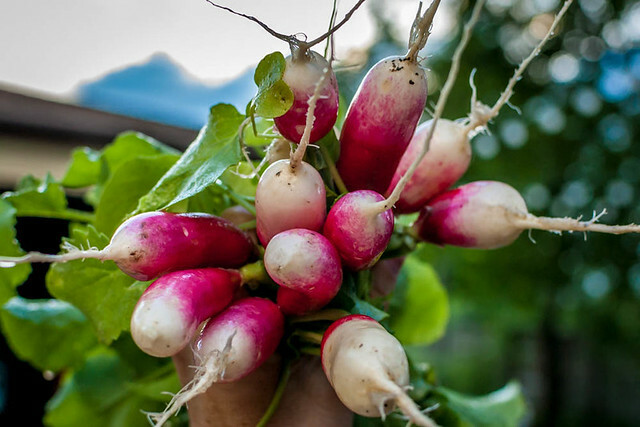 Radishes are a great instant gratification crop to grow with kids, because they germinate in just a few days and are ready to harvest in as little as 22 days. Radishes are great in salads and tacos, but you can really only burn through so many as a garnish, and my very favorite radish recipe- Radish, butter, and salt open faced sandwiches– is off the table this year as Cop and I are still eating dairy free. I’ll be pinning dairy free recipes to highlight veggies from our garden all summer- follow my Garden Goodies board on Pinterest, and comment below if you’ve got a great recipe to share! Forget pinning…I am going to Dreape. Get it?